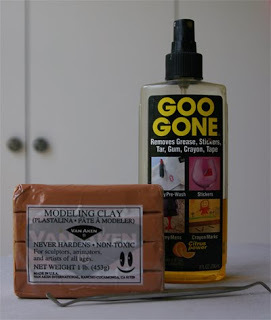 I’ve had a couple of questions lately about what kinds of originals I use when making molds. 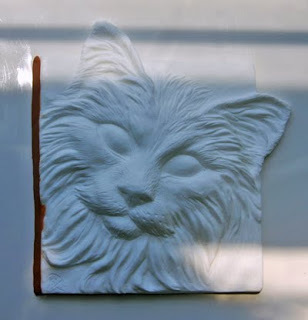 I thought this project for Meows and Minis would be good for illustrating how resin originals are used in making ceramic molds. The original was sculpted by Becky Turner in clay and then cast in white resin. One of those copies was then sent to me to make the ceramic molds. I can make molds from clay originals, and have done that with my own pieces before. “Inspire” was done that way last winter. 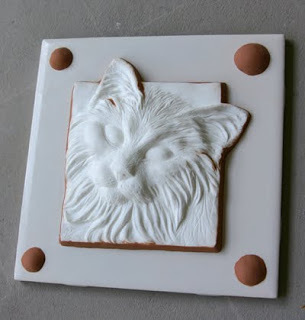 When working with simple medallions or tiles with a two-piece mold (a face and a “lid”), there isn’t really a need to make a hard original. That changes, however, when someone needs to mail the original to me. Resin copies are a lot easier to ship. The only downside is that some things that work in resin don’t really work with plaster and clay. That’s because resin is typically poured into a flexible rubber mold. I make a rubber master mold, but that’s for making the plaster molds. The actual castings come out of those, and they obviously don’t bend. Medallions are even more tricky because they don’t have any hand-holds. The piece has to pop out clean from a rigid block. That usually requires a bit of “editing” when a medallion wasn’t originally designed for ceramic production. The biggest concern with most medallions are the outside edges. For the piece to come out easily, they need to be bevelled. 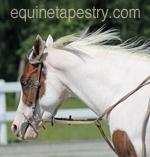 I learned this the hard way with my first medallion, the Celtic Pony. In the linked post, you can see the first version which has perfectly straight sides. After fussing forever with getting them out of the mold in one piece, I finally redesigned it so the sides (and the inside border) sloped ever so slightly. Life was instantly easier! In the picture above, the resin copy has been glued to a glazed tile. Where the resin meets the tile, you can see the shadow cast along the bottom edge of the design. It actually slopes slightly inward, which will pin the castings inside the mold. You can see where I’ve started to add the bevel on the left-hand side. I don’t want to add much, because I don’t want to change the feel of Becky’s design, and I need to be careful to perserve the organic quality of her edges. The trick is to add just enough to make it work. These are my have-to-have tools for this kind of work. I do all my claying up, including the more elaborate full-body horse molds, with this kind of soft, inexpensive Plastalina clay. I like the brown for when I work with white resin because I can see it. I use a bright robin’s egg blue when I work with clay originals, again so I can see it against the original. I use the Goo Gone as a solvent to smooth the Plastalina, though I sometimes use vegetable oil instead. Both seem to work pretty well. The tool in front is my favorite for getting a steady bevel. This is a close-up of the same tool. One side of the tool is slightly domed (facing the camera) and the other is flat. It’s just about the right depth to catch the edge of the medallion. By holding it at a steady angle against that edge, I can get a consistent bevel. 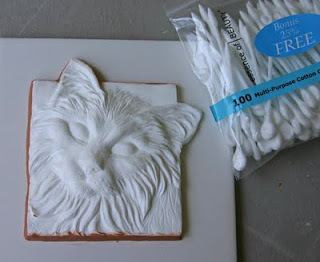 I use these shaped Q-tips soaked in Goo Gone to clean the excess clay from the resin. Here the top and left side have been cleaned of excess clay but the bottom has not. In this picture bevels have been added to all four sides. I’ve also taken care of some of the undercuts created by the fur and by the edge of the topmost ear. Undercuts are areas that are hidden behind a part of the design when viewed from the direction that the mold piece pulls. In ceramic molds, undercut areas will either bind the casting into the mold, or tear the casting as it is removed. Slight undercuts like the ones in his fur are sometimes workable in a multi-piece mold because you can jiggle the casting free. In a one-piece mold like a medallion, even a small undercut can make it difficult to free the casting. To prevent that, I have “flooded” the undercuts, which is just filling them flush with clay. You can see I’ve done that with two sections of fur, one on each side of the face, and along the edge of the ear. If the undercut is important to the design, I can take the excess back out again when I clean the castings. I will probably so with the ear on this particular design. It actually takes less time to resculpt that area on each casting than to repair (or repour) the damaged castings when they stick. This is a trade-off that happens with full-bodied horses, too. Sometimes it is less work to add details like hoof bottoms to each casting that to work with the undercut. Finally the last step is adding the keys. Those are the half-circles at the corners of the tile. I need keys so that the second piece of the mold, the lid, will stay in place without shifting. It is much cleaner to sculpt keys in clay than to cut them later into the rubber. Now the original is all ready to be boxed up so the rubber master mold can be poured. With luck I will have plaster production molds from this drying by the weekend. wow, Im a bit behind in reading blogs so I sure was tickled and excited when I saw my cat medallion on your blog! and Im really looking forward to getting a glazed one !.. Oh and I love that your doing your inspire medallion in terra-cotta.. I love terra-cotta and that is one of my very favorite medallions … so Im really excited to see it with glazes on it.. Im sure you’ll do fine. Im always in awe when I see actual sculpture out of terra-cotta.. I have tried it and I just can’t sculpt with it but I sure love the look of it, so you and sara doing tiles in it.. well cool! and thanks for using my cat as a example on your blog!